According to the FCA: "We did not receive consistent instructions from Vital Records’ Offices, reflective of what one might expect in the absence of documented instructions. In addition, some of the offices appeared to be particularly ill prepared and had not given much thought to how they would handle the filing of a death certificate from someone other than a funeral director. Information has been provided for 1) the situation where a person dies at home and 2) where a person dies in an institution". Information on both processes (paper and EDRS) has been presented below. Permit for Disposition. A Permit for Disposition is required in order for a cemetery or crematory to accept delivery of a body for final disposition. This permit will be issued at the time the death registration is approved. Cremation Only: If cremation is chosen as the method of disposition of the body, then the deceased must already have signed--or a authorized next of kin must sign - a Declaration for the Disposal of Cremated Remains. 1. Go to your county vital records office (locations listed below) and ask them to enter the necessary information into EDRS for you or to provide you with a blank death certificate. Some of the offices we contacted indicated they would only process a death certificate using EDRS and others indicated they would provide a paper death certificate. One of the offices indicated they would want documentation from a physician indicating the time, date, and cause of death to initiate this process. It might be a good idea to obtain this information in writing from the attending physician to save time. It is not possible to download a blank death certificate electronically. Monday - Friday, 9:00 a.m. - 12:00 Noon and 1:00 - 4:00 p.m. Closed for lunch from 12:00 - 1:00 p.m.
Public Counter Hours: 8:00 a.m. - 4:15 p.m. Phone: (530) 749-7851 Fax: (530) 749-7854 Office Hours: 8:00 a.m. - 5:00 p.m.
2. 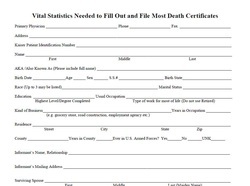 Fill in all of the information required on the death certificate. EDRS: Provide the information to the office personnel and they will enter the information into EDRS Electronic Death Registration System . Paper: Make sure the information is filled out very carefully, as any questions, omissions, discrepancies, erasures or whiteouts will delay the filing of the death certificate or void the form entirely. Personal information about the deceased: The Informant (a family member or anyone who can supply the necessary information) fills out/provides the personal information about the deceased. The Informant must identify him/herself on the death certificate as the person providing the information. Medical information about the death : The attending doctor or the medical person provides the information about the death, including date, time and cause of death. The doctor/medical person must provide a valid medical license number on the death certificate form and sign it. EDRS Electronic Death Registration System : The office personnel will route the death certificate using EDRS to the physician for them to complete electronically. You do not have to do anything further. Paper: Have the attending doctor or the medical person complete the Medical Information section of the death certificate. Call ahead to make sure he/she is in the office before showing up to have the death certificate completed. Also, because doctors are used to using EDRS there may be some confusion as to why a paper death certificate is being used. 3. Return the completed death certificate form (if using paper). A member of the deceased’s immediate family or other authorized person (see NOTE below) should return the completed death certificate form to the office where it was picked up as soon as possible after the death, but at least within eight days of the death (Health and Safety Code Section 102775). Office personnel will review the information for completeness, mistakes or any medical information that may necessitate involving the Coroner. If the death certificate is processed using EDRS, the office personnel will review for completion electronically and will review to determine if any medical information received necessitates involving the Coroner. If there are no problems, the death certificate will be filed and the family member or authorized person may purchase certified copies. It may not be possible to file the death certificate and purchase certified copies the same day, so be prepared to make yet another visit to the office to pick up the certified copies. Or you can do it by mail. Cost: There is no cost to file the death certificate. The cost of a certified copy of the death certificate is $12 in all counties (price increase anticipated in January 2012). It is usually recommended that 10 certified copies be purchased, as there are a variety of entities (banks, insurance companies, etc) that may require them. (1) The registrant or a parent or legal guardian of the registrant. (2) A party entitled to receive the record as a result of a court order, or an attorney or a licensed adoption agency seeking the birth record in order to comply with the requirements of Section 3140 or 7603 of the Family Code. (3) A member of a law enforcement agency or a representative of another governmental agency, as provided by law, who is conducting official business. (4) A child, grandparent, grandchild, sibling, spouse, or domestic partner of the registrant. (5) An attorney representing the registrant or the registrant's estate, or any person or agency empowered by statute or appointed by a court to act on behalf of the registrant or the registrant's estate. (6) Any agent or employee of a funeral establishment who acts within the course and scope of his or her employment and who orders certified copies of a death certificate on behalf of any individual specified in paragraphs (1) to (5), inclusive, of subdivision (a) of Section 7100. 5. Request a Permit for Disposition. At the same time the death certificate is filed, be sure to ask for a Permit for Disposition, also called a Burial Permit (cost is ~$11). The Disposition Permit is required in order to deliver the remains to a cemetery or crematory for final disposition. Be prepared to supply the name of the cemetery or crematory where the body will be delivered. You may transport the remains yourself if you have a Disposition Permit. If a person dies in an institution such as a nursing home or a hospital, the institution will file the death certificate using the State of California Electronic Death Registration System (EDRS). There is a place in this electronic form to indicate who will be making the disposition arrangements for the body. Usually they want the name of a mortuary for this, but the name of the family member who will be directing the arrangements may be supplied instead. California Health and Safety Code, Section 102875(a)(6) specifies that for disposition of the remains the “name of the funeral director, or person acting as such” be provided in the death certificate. Institutions often have regulations that specify that they only release the remains to a mortuary. No law requires this, but the institution faces some liability if they release the remains to a family member and subsequent controversy arises among family members about the body. The institution may therefore refuse to release the remains to a family member. If possible, the family or agent should consult with the institution before the death occurs about their specific regulations regarding releasing the body, trying to arrive at some arrangement whereby the body can be released to the family or to a particular family member. There may be waivers or hold-harmless agreements to sign in order for the institution to agree to what they consider to be a non-standard arrangement. If the family has physical custody of the body and will be transporting it for burial, a Permit for Disposition will be required (see number 5 above), along with certified copies of the Death Certificate (see number 4 above). The death registration will already have been filed by the institution, so it is just a matter of getting the certified copies.